With features that allow you to choose to absorb or on-charge the cost of accepting credit cards, create pre-payment transactions from accepted quotes with zero touch reconciliation and automatically vary merchant based on payment method selected, is it any wonder why we call it Wise-Pay? 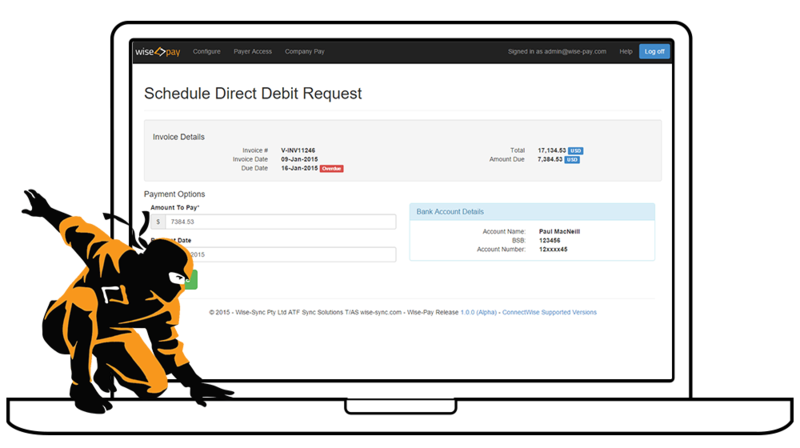 Wise-Pay offers flexibility in managing scheduled payments, by automatically scheduling payments based on invoice terms for customers with standing debit agreements. Want to charge a convenience fee, but managing it makes it economically unviable? 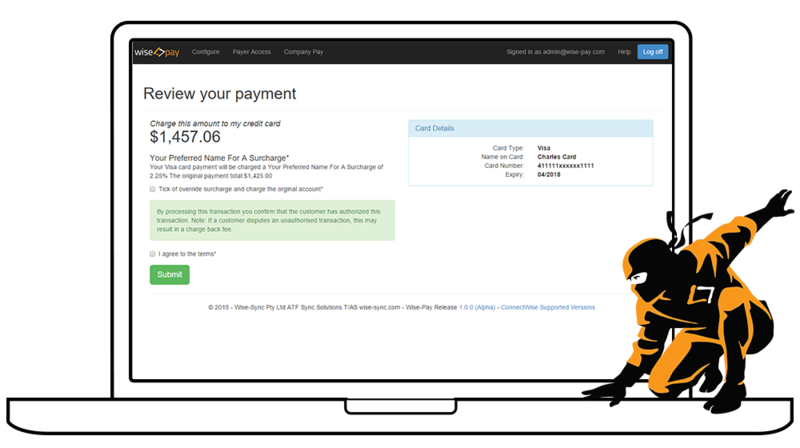 Wise-Pay allows you to charge a service fee for online transactions and gives you the ability to rename it – a surcharge, an online card processing charge or convenience fee. You decide. 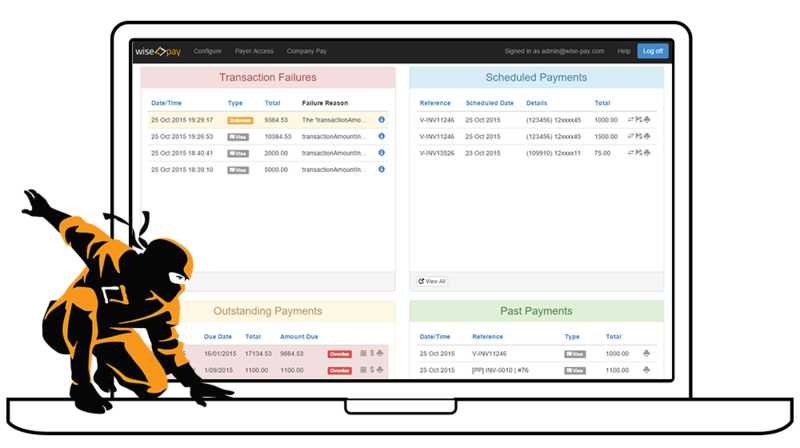 Wise-Pay automatically creates pre-payment transactions in your accounting system, no more fumbling to find un-reconciled transaction information – it’s already done. Want greater flexibility around payments? Wise-Pay payments can be processed with a preferred merchant for different payment types. Want to use your primary merchant for debits from bank accounts and use a second provider to process credit cards? No problem. 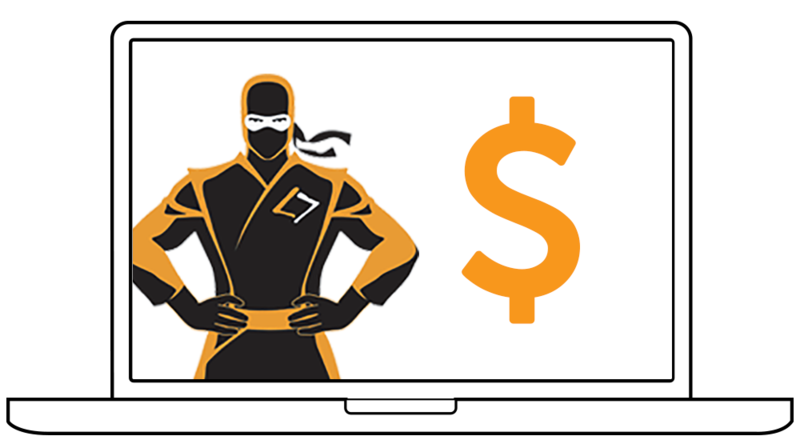 With direct integration to ConnectWise and Quosal, Wise-Pay seamlessly links your MSP to PCI compliant payment services. Make light work of accepting, managing and reconciling card payments. 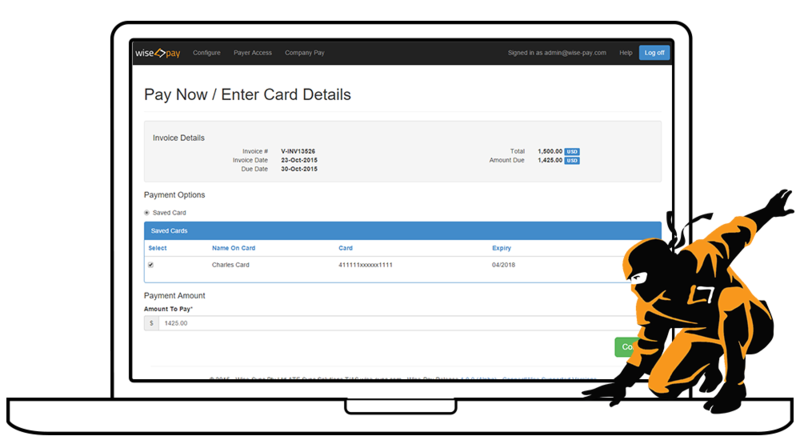 Offer more than just Authorize.Net, directly link the ConnectWise Customer Portal [Pay Now] button to Wise-Pay and handle credit card payments like a pro. Accepting pre-payments on your quotes shouldn’t be a game of ‘Where’d that money go?'. Wise-Pay will create the pre-payment receipt for the customer – creating zero touch reconciliation. 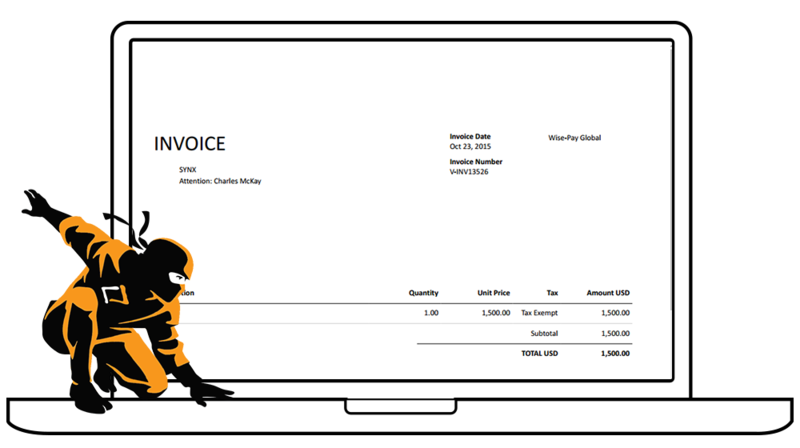 We all know that you can put links into a ConnectWise Invoice Email Template, it is HTML afterall. Wise-Pay makes light work by sending your customers to an integrated page that knows exactly the amount outstanding (even if there are scheduled payments outstanding). Xero provides direct integration for Payment Providers, but that doesn’t take into account payments flow from ConnectWise or other locations. Wise-Pay is directly linked to your accounting system, to display the exact balance outstanding – never letting your client pay too much (or too little). Each customer is provided a secure management portal to manage their credit card and bank accounts in a secure way. Wise-Pay only integrates to PCI Level 1 Providers, who support Tokenized Payment Methods, to ensure that Credit Card data is never stored outside of your payment provider network. We love Desk Director so much – we had to make sure that payments were possible. 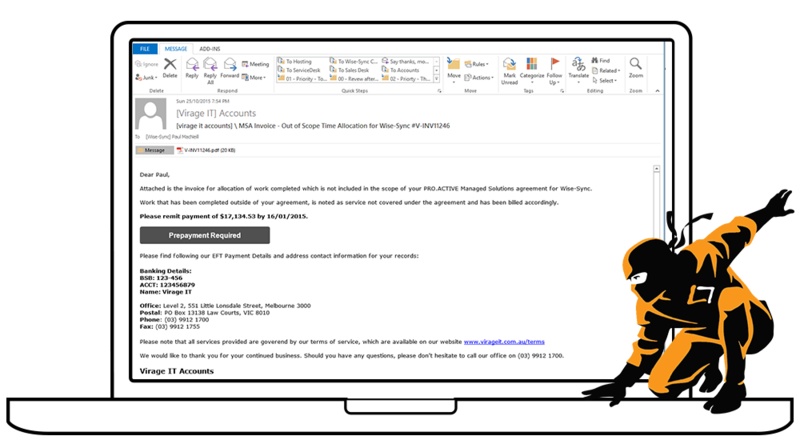 We provide a customer authentication hand-off for Desk Director partners so they can continue to provide direct interaction with outstanding invoices through Wise-Pay. 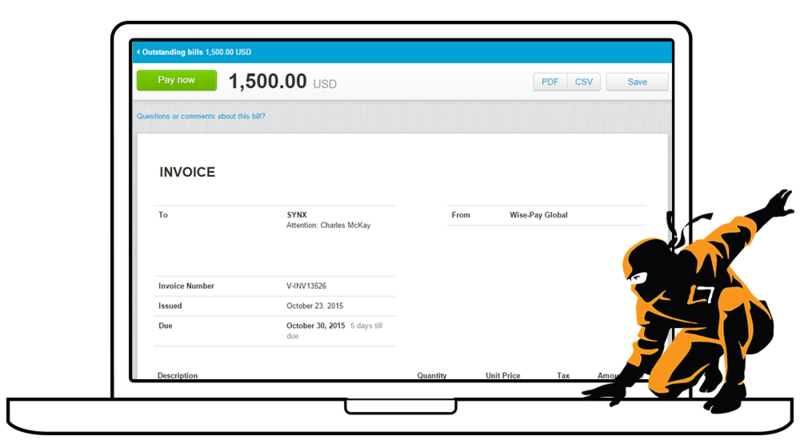 Accepting pre-payments on your quotes just became easy with Wise-Pay. With direct integration into QuoteWerks, partners can offer simple payment options for online quotes. Wise-Pay is the only integrated, customisable, multi-merchant platform for ConnectWise & Quosal. Integrating to world class merchants including Authorize.Net, Braintree, Stripe and IntegraPay, payments can be set to vary merchant by payment type, and includes support for global currencies and regions. 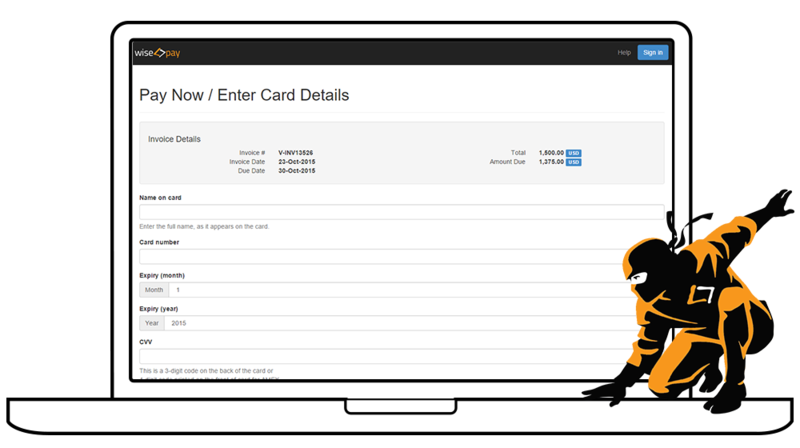 Wise-Pay offers an expanded integrated platform for processing credit cards, with the capability for businesses to pass on credit card surcharges – not natively possible in the ConnectWise Portal payment flow. One of the largest global payment providers – backed by PayPal. Braintree payments offer flexible payment options including the usual card types, as well as ApplePay, GoogleWallet and BitCoin. Stripe offer some of the most competitive rates on the market. With simple sign up (instant transaction processing) and a simple to use management console, Stripe offers a flexible solution for partners not processing many transactions. IntegraPay are a world leader in recurring bank debit, CNP (Card Not Present), and real time payment solutions, offering payment processing solutions in AU, NZ and US with direct bank transactions also supported in AU.